On the 6th of December, I got up at three in the morning and went to the international airport. Christmas is coming up and I want to be home. 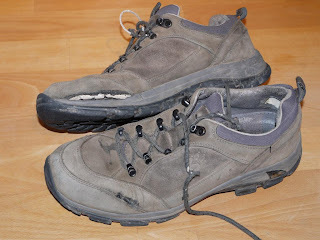 So this blog is going into hibernation again. As before, I am going to edit my notes, organize my thousands of pictures, and post a polished version on my homepage, www.bitrot.de, in a few weeks. So, for now, farewell to my readers, I hope you'll follow my future adventures too! I have spent most of 2009 on the road. All my travel reports in Europe, Asia, America, and Africa can be found here. Wat Saket, the Golden Mount, is a steep and tall artificial hill north of the old town, with whitewashed staircases all the way up and a golden Chedi on top. A procession of monks in bright orange robes were marching up, beating a gong and chatting for a while, and then back down. The views from the top is great. People are praying, and there is a souvenir shop too. At the foot of the hill is a modern wat with a huge golden sitting Buddha. On the way there I was once again stalked by a nice guy who is a professional (check), has a brother in Frankfurt (check), Wat Saket is closed today (check) - and then he turned and left without another word. I walked to the old downtown, where the palace is. There are no skytrains here, no massive structure like that could be built there. I used a river taxi on the Chao Praya instead. The city is unusually quiet, and there were colorful military parades, because this is king Bhumibol's birthday and the king is highly revered in Thailand. At night they had massive fireworks. 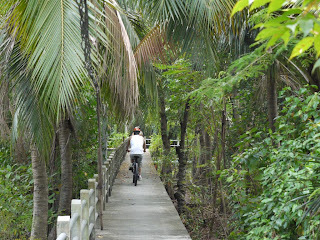 I had booked a bicycle tour with Spice Roads to the Bangkok Jungle, Bang Kra Jao. That's part of a peninsula formed by a loop of the Chao Praya, connected to the city only by a narrow land bridge. It's quite large, and even though it's very close to Bangkok's Sukhumvit business district, it's undeveloped. There are two short narrow roads, and a maze of narrow raised conrete walkways through dense forests and rice fields. There are a few small farm houses and a very small wat. Unbelievable that such a peaceful place can exist so close to the center of Bangkok. For once, I had a good well-maintained bicycle with the correct size, and a helmet. Very nice ride. This is my fifth visit to Bangkok and I have done all the usual sights before, most several times (see here and here). So I decided to visit the modern parts of Bangkok, like Silom and Sukhumvit where few tourists go, to see how the city works. It's quite modern and clean, lots of malls, office towers, concrete, steel, and glass, but also trees. When I saw this part of town for the first time 11 years ago it was a howling mass of traffic and unbelievably polluted, and they were constructing an elevated skytrain system. That system was now complete and running, and it's working. The tracks and stations use about ten times as much concrete as you'd think would be necessary, but it's fast, efficient, and clean. I could no longer see blue smog rising up from the streets. The Bangkok business district has still too much traffic and is certainly not beautiful, but it has come a long way to a modern working city. Christmas ornaments are everywhere in this Buddhist country. Huge opulent dioaramas with six-meter trees, green, blue, gold, or silver; phone booth-sized snow-covered swiss chalets, Cinderella, Disney dwarves, elks, snowmen, angels, and gingerbread houses. I asked some people about this but they were very unclear about the notion of snow. Like in Europe, all these things are just symbols for the annual shopping season. No prisoners taken. Pantip Plaza is a six-floor department store packed with electronic shops. It's like Tokyo's Akihabara district packed into a single very large building. Shabbier of course, and not as cutting-edge, but it's a lot of fun. 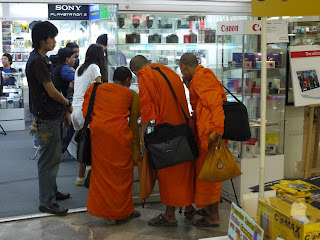 And there are no orange-rober Buddhist monks browsing around in Akihabara. I also had the pleasure of meeting another Bangkok institution, the Common Gem Scammer. He walked up to me and gave an impeccable textbook presentation, well-dressed and polite (check), has a brother in Frankfurt (check), the place I am going to is closed today (check), please follow me (check) - but here I excused myself because the next stage of the script is fun but time-consuming. It involves following him to his uncle's one-time government gem auction where I can buy expensive worthless pieces of glass that I am supposed to be able to sell for twice that price at home. Right. I decide to spend the money on a fresh fish with Thai spices at the excellent Baan Khanita restaurant instead.